that locality, and enjoys a comfortable competence and enviable name by his efforts in helping build up the best interests of his section. He enjoys a nice home in Fullerton township, where he has spent many years. Mr. Hodges was born in Kent county, Michigan, October 8, 1869. He is the eldest of three children in the family of Frank and Jane Hodges, two born in Michigan and a daughter after coming to Merrick county, where the family settled when Herbert was four years old. They moved into Nance county in the fall of 1877, the father purchasing three hundred and twenty acres of farm land on sections thirty-one and thirty-two, township seventeen, range six, and erecting a dwelling the first-named section. Here our subject grew to manhood, receiving his early education in the public schools, and later attending the Commercial College at Omaha. In 1891 he began working rented land for his father, and also got together a bunch of stock and was successful in building up his farm, gradually putting improvements on it, planting trees and groves, and got it in first class condition then changed his residence to where he owned one hundred and sixty acres, which has been his home farm ever since. He is now the owner of four hundred and fifty-four acres of land three hundred and fifty-four acres being situated in section thirty-one, Fullerton township, and one hundred acres in section twenty-six, Timber Creek township, Nance county. Mr. Hodges was married January 1, 1893, to Miss Lillie Vosburgh, daughter of Willis and Minerva Vosburgh, who made Nance county their home for a number of years. Her father is now dead while Mrs. Vosburgh makes her home in California. Mr. and Mrs. Hodges have four children, namely: Nellie, Stella, Herbert F. and Pearl, all now living at home. Both of Mr. Hodges' parents are deceased. Mr. Hodges is a man of sterling character, energetic and capable, a good business man, and has been very successful during his career. He has taken an active interest in local affairs during his residence in Nance county, helping to establish the schools, etc., and for the past seventeen years has been a member of the school board of district number fifty-three. Theodore Wheeler, one of Atkinson' s first business men, now living retired from active work first came to Nebraska in 1880. October 10 of that year he filed on a homestead and timber claim, fifteen miles northwest of town. He and a son Willard A Wheeler, opened a store at Atkinson January 1, 1881 as soon as a building could be erected and they continued in business until 1885, when the store was sold. During this time, they were also interested in a ranch, the son managing the store and the father the ranch. In 1887 the ranch was rented, and the father has since been a resident of Atkinson. The two men continued business in the line of raising cattle and sheep until 1904, when they sold out. Theodore Wheeler was born in Mendonville, New York, September 27, 1830, and lived in his native place until 1860, when he removed to the state of Illinois. He resided near the county seat of Kankakee county two years, then moved to Iroquois county, and lived on the "Hurricane Farm," which was the property of Lemuel Milk, until he came to Nebraska in 1880. His contract with Mr. Milk provided for a partnership, which was very satisfactory to both parties during its life. Upon making the trip to Nebraska, Mr. Wheeler traveled as far as Wahoo by rail, and as there was then no railroad reaching to Holt county, he made the rest of the journey by wagon. Mr. Wheeler is a son of George W. Wheeler, who was born in Mohawk Valley, New York, December 19, 1799, a few days after the death of the first president of the United States, after whom he was named, and his christening occurred on the day of Washington's funeral, although the news of the death of the illustrious man was not received until three weeks after his demise so slow was the dissemination of news in those days. Mr. Wheeler's marriage occurred in Montgomery county, New York, June 26, 1859, when he was united with Miss Elizabeth Andrews, who was born in Oppenheim, New York, daughter of Sabina and Elizabeth (Bartlett) Andrews. Two children blessed their union, Willard A. and Elma. The latter died in 1881, at the age of nineteen years, and was the first person interred in the cemetery at Atkinson. concrete product for either plain or ornamental use. The first marriage of Willard A. Wheeler took place June 6, 1886, his bride being Miss Laura Graham, daughter of Samuel L. and Belle (Taylor) Graham, who died eighteen months after their marriage, leaving one daughter, who died in infancy. Mr. Wheeler was married again at Hot Springs, South Dakota, to Miss Carrie Olsen, a native of Norway, who died February 19, 1904. Father and son are life-long democrats, and have always given their hearty support to the candidates of their party who have been worthy of their allegiance. The elder Mr. Wheeler became a member of the Masonic order in the lodge of Chebanse, while living in Iroquois county, Illinois, and is now the only charter member left of the lodge at Atkinson, in which his son has received three degrees. While a resident of Hot Springs, the latter joined the Chapter, and served as high priest in that branch of the order. He was also a member of the Commandery there. One of the early experiences which the Wheelers remember of their early life in Nebraska, is the blizzard of October 15 to 17, 1880, which overtook them while they were excavating the cellar for their new store building, and this had to be shoveled out later, as it was entirely filled. The building preceding the one they then erected was a mere shack, and theirs was the first pretentious store building in the town, the lumber for it being hauled from Niobrara, seventy miles across the open country, six days being required for the round trip necessary to bring each load. Mr. Wheeler also erected the first barn that was made of lumber, the previous ones used there being of sod with hay roofs. At the time of the blizzard of January 12, 1888, Willard Wheeler, then serving as postmaster, happened to be at home eating dinner when the storm arose, and so severe was it that he could not return to the office, where his deputy kept lone watch until the closing hour, with no work to attend to, as none ventured out in so severe a storm for their mail. One of the sad events which occurred during their early years in Nebraska was the tragic death of the Biglow brothers, who were caught by the caving in of a well they were digging. They had come to the state with Mr. Wheeler, and he was one of the many neighbors who came from miles around and dug desperately to accomplish their rescue. However, on account of the caving in of the sandy soil, this work was fraught with great danger. Although one of them lived four days, it was five days before their bodies could be reached, on account of the conditions above described. This untoward event cast a gloom over the entire settlement, which was then small, and could ill afford to spare any of its citizens. The elder Mr. Wheeler freighted all the merchandise for their general store from Neligh, and frequently was in the wagon train with Mr. Peacock, a prominent and well-known settler of Rock county. Deer, antelope and elk were plentiful in the earliest days, and venison was at times their only meat during the first few years. Freighters from the west frequently killed cattle on the ranges as they came eastward, and sold meat to the settlers, who did not ask whose cattle had been killed - necessity knowing no law. "Doc" Middleton, Ardmore "Kid" Wade and other noted "rustlers" were well-known figures on the frontier, and were frequently to be seen in the Atkinson stores. Fuel was hard to get in the first years, and coal was to be had only at the railroad terminus, and at one time cedar posts, standard mediums of exchange, were the only fuel available at the stores. Billie Reed, who had shot the sheriff at 0'Neill, was caught in Atkinson, five men in the posse suspecting that he was in Mr. Wheeler's house, which they surrounded, much to the fright of Mrs. Wheeler. It transpired, however, that he was hiding in a store across the road, from which he was finally dislodged. At his trial, where he was supported by all the cattlemen of that region, he was cleared. Those wild days are now but a memory, and stand in strange contrast to the present staid, well-settled condition of the country, exciting wonder that so great a change could take place in the space of time that has marked comparatively a few short years. John Halligan, a prosperous and progressive farmer of Boone county, is the owner of a valuable estate in Manchester precinct. By his thrift and energy, aided by a natural business ability, he has gathered about him an ample sufficiency of this world's goods to guarantee immunity from want in his old age. Mr. Halligan was born in Kings county, Ireland, on March 18, 1848, being the fourth of six children in the family of John and Ann Halligan. When John was two years of age, the father, mother and four children came to America, their first settlement being in Montgomery county, New York state. They remained there for several years, then removed to Racine county, Wisconsin, and later to Juneau county, that state, where our subject received his early education. The father was a farmer, he dying in Juneau county about 1855, and his wife died at the home of our subject in 1879, in Boone county, Nebraska. Our subject came into Boone county in 1874, homesteading on section ten, township twenty, range five, and later removed to section twelve, which is his present location. He had a fine farm of three hundred and twenty acres, situated in Jennings valley, improved in splendid shape, with good buildings and every equipment for carrying on a model stock and grain farm. Since coming to Nebraska, Mr. Halligan has experienced the real old-time hardships and difficulties familiar to the pioneers of the west. He has been intimately identified with the growth and development of the county in which he chose his home, and through it all has become successful in a marked degree, gaining the friendship and esteem of all with whom he has had to do. He is prominent along educational lines, a man who is recognized by all as a clear thinker, fluent speaker and, although not an office holder, is ever active in political matters. Mr. Halligan was married in Platte county, Nebraska, October 30, 1877, to Miss Ellen Tierney, her family having settled in Boone county in the same years as our subject. To Mr. and Mrs. Halligan have been born six children, the following of whom are now living: Dr. Raymond S. who is married, and the father of two children; he is a graduate of the medical department of the Northwestern University, Chicago, and is now living in Flint, Michigan; Gerald P., Anna and John Emmett. Mr. Halligan has one brother living in Albion. For the past twenty years Mr. Halligan has been a director of school district number sixty-one. Mr. W. S. Brown, known throughout this section as an able and progressive farmer, resides in his pleasant home on section one, township twenty five, range three, and is one of the respected citizens of the county. Since coming to this locality, many years ago, he has always taken a foremost place in the development of this region. He has succeeded in building up a good farm, and may be classed among the self-made men of the locality, and has gained the respect and esteem of his fellow men. Mr. Brown is a native of the state of Ohio, and was born October 30, 1842, the son of W. B. and Myra Brown, both from Pennsylvania. Both parents were of German descent. In 1850, when our subscriber was only eight years old, the family removed to Livingston county, Illinois. It was here that he grew up and received his education, and it was in this state, also, that he was married. In 1880, Mr. Brown came to Pottawattomie county, Iowa, but remained there only five years, when he again moved, this time coming to Wayne county, Nebraska, where, the year before; he had bought a farm of three hundred and twenty acres, which has since been his home. He has made many improvements on the place since it came into his possession, and it is now one of the best-equipped in the county, with buildings, grove and orchard and well tilled fields. In 1861, Mr. Brown was united in marriage to Miss Almyra Zigler, of Illinois, who died in 1867. In 1871, he was united in marriage to Miss Martha Hart, of Ohio, who died in 1896. He is the father of eight children, all by the second wife. Their names are Cora Bell, Lawrence, Mary, Chester, deceased, Leroy, Lucy, Bertha and Wayne. He was again married in 1900, this time to Miss Laura Frederick, of Ohio. Mr. and Mrs. Brown are members of the Methodist Episcopal church, and Mr. Brown is a republican. One of the most successful early settlers of Staunton county is the genial Fred Feyerherm, now retired, living in the county seat. He has been successful, not only as a landed proprietor, but as a merchant and honored county official as well. Mr. Feyerherm was born in the town of Barwalde, province of Brandenburg, Prussia, February 26, 1852. Here he spent the years of his childhood and youth, as his parents, Frederick W. and Eleanor (Rindfieisch) Feyerherm, did not leave Germany until 1868. They sailed from Hamburg on the steamer "Utonia," and arrived in New York city after a voyage of fourteen days. The father settled with his family in Cuming county, where a brother had preceded him, and lived out his days on the farm. Fred remained at home with his parents, working the farm for his father, until he was twenty-four years old. He was then married at Rock Creek to Miss Bertha Schultz, daughter of John M. and Sophie (Dewitz) Schultz, natives of Altruednitz am Oder, in the province of Brandenburg, who came to this country in 1867. After his marriage, Mr. Feyerherm took charge of his father's farm in his own right, living there some seven years or more. In 1883, he removed to Staunton county, and bought a farm about five miles from the county seat, to which the family moved after a year's residence on the farm. Mrs. Feyerherm was a delicate woman, and her strength did not prove equal to the demands made upon it by the work on the farm in those early days, and it was hoped that a few years of the greater ease in town would fully restore her to health. Mrs. Feyerherm once had the unusual experience of reading her own obituary. A neighbor died when Mrs. Feyerherm was critically ill, and the report went out that she had passed away. a republican, while the county is strongly democratic. Mr. Feyerherm passed through the vicissitudes of a pioneer's life in Nebraska, and has seen the country develop from the time when it was almost entirely wild, with flocks of antelope ranging over the prairies, to its present state. Indians gave them but little trouble, although when the men were away working, their incessant begging for bread or flour used to make the feminine portion of the household nervous. Of the nine children born to Mr. and Mrs. Feyerherm, seven are living. Their names are as follows: Ella (Mrs. Alfred Claus), of Lewiston, Minnesota; Fred; Clara (Mrs. Henry Schwartz), of Menominee, Wisconsin; Eric, Edith, Irene and Freda. Mr. Feyerherm and his family are members of the St. John's Lutheran church of Staunton. This family is well known socially, their musical talents alone being sufficient to bring them into notice. All of the children have fine voices, and they are also pianists of no ordinary ability. The young ladies are members of an excellent female quartet, which has attracted more than local attention, being recognized as splendid talent in western Nebraska. Isaac F. Billings, who resides in section twenty-six, township twenty-seven, range eight, Antelope county, Nebraska, is one of the progressive farmers of that locality. He is a gentleman of firm characteristics, whose high standing as a worthy citizen is well merited. Mr. Billings is a typical pioneer of northeastern Nebraska has lived many years in this section of the country, and has taken an active interest in the growth and development of this region, building up for himself a substantial home and fortune. Mr. Billings was born March 25, 1843, in Tioga county, Pennsylvania, and was the eldest of five children in the family of Charles and Lucinda (Fields) Billings. Our subject's father was born in 1816, in the state of New York, and was a descendant from Ireland. He died in 1901. The mother of our subject was a native of Vermont, horn in 1828, and died in 1895. Our subject, with his parents, moved from Pennsylvania to Michigan, where he lived seven years, and from thence to Illinois, where they lived one year, then moving to Minnesota, where they took up a homestead, on which they built a log house, sixteen by sixteen feet, where the father and mother and five children lived for twenty years. In 1877, the family came overland, in a covered wagon, to Nebraska, where Mr. Billings took up a homestead and timber claim in Holt county, near what is known as "Gunter bridge," near Ewing. Here the family experienced many hardships in those pioneer days, and, like so many other brave pioneer farmers, they lost their crops by the grasshopper raids. The winters of 1880 and 1881 were very hard for a family just starting in this section of the country. Antelope and deer were plentiful in those days, which proved to be very fortunate for our subject and family, as the snow was very deep, and they could not get to market at Norfolk, that being the nearest market, and they could occasionally go out and bring down a deer, keeping themselves supplied with meat. On November 14, 1884, Mr. Billings was united in marriage to Miss Blanche Ball, and Mr. and Mrs. Billings are the parents of the following children: Arthur, Charles, Earl and Mabel. Arthur is married to Miss Bertha Rankin. Mrs. Billings' parents were early settlers in Nebraska. They drove from Jo Daviess county, Illinois, to Blaine township, Nebraska, in the early days, taking up a homestead. Her father was born in the state of New York, and was a descendant from England. Mr. Billings relates many interesting reminiscences of early days in Nebraska. In September, 1879, a severe prairie fire burned its way across the prairie, and to save the hay, Mr. Billings plowed a fire guard around his stacks, and then started a back fire. His fire burned back about two rods, when a tumbling weed, which was ignited, blew back, and set fire to the stack. and the fire then swept on. Mr. Billings had to run for shelter to a cornfield, which was near. The fire jumped Elkhorn river, and swept on toward O'Neill, but Mr. Billings' house and buildings escaped. Norton Wright, owner of the Walnut Grove Farm, through his long residence in Pierce county, Nebraska, and his wide experience in farming, has become thoroughly versed in the growth and development of that region. He is one of the leading citizens of his community, and has acquired valuable possessions by his industry and good management, supplemented by honesty and integrity. in a sod house. The first year they failed to get a crop planted, and the two following years the grasshoppers took every blade of wheat and corn. In 1880, the father filed on a homestead in Antelope county, eight miles west of Plainview. During the following winter, snow drifted over the barn to such a depth that a tunnel was necessary, and during this winter they burned hay for fuel most of the time, and cornstalks were hauled half a mile for the same purpose. A son riding out from 0'Neill was from early morning until midnight making eighteen miles, on account of the snow, having to borrow a mule to complete the journey, his horse becoming exhausted on the way. Flour, at times, could not be procured, and johnny cake was their only food. But they lived to attain comfort and competence before leaving Nebraska. The elder Wright returned to Michigan in 1889, where he and his wife passed the remainder of their days. One half-section he sold for six hundred dollars - it could not be bought now for sixteen thousand dollars. Norton Wright was united in holy matrimony, April 10, 1889, to Miss Emma Davis, a native of Jefferson county, Pennsylvania, born July 22, 1869. Her parents, Oathniel and Maggie (Riegel) Davis, were also natives of that state. They came west in February, 1870, and settled in Madison county, remaining thirteen years, when they bought a settler's timber claim in the southeast quarter of section seven, township twenty-seven, range four, and later sold to Mr. Wright, and which he has since extensively improved. In the blizzard of 1888, he made his way some forty rods to the school house, and safely returned with a nephew. He escaped the three-day blizzard, beginning October 15, 1881, by fortunately returning home from the range the evening before. To Mr. and Mrs. Wright, five children have been born, named as follows: Charles L., Maggie M., Henry O., Loretta (died in 1907) and Winetta. Ava, an adopted daughter, has been with them almost since infancy. They are a fine family, and enjoy the esteem and respect of all who know them. Mr. Wright has two hundred and forty acres of land, on which is a ten-acre grove. The grove to the west of the house is of fine growing walnuts, which gives the farm its name. An orchard of about one hundred trees, some of which have been bearing a number of years furnishes an abundance of fruit - apples, cherries and plums being the principal varieties. The farm supports from fifteen to twenty horses, thirty to forty cattle, and a hundred and fifty cows. All this is the result of the personal effort of Mr. and Mrs. Wright. Few in the west began with as little, few suffered greater privation, and not many have attained from such a small beginning such great success. At the time of their marriage, this worthy couple lacked the price of a license fee, and had to borrow the amount from a friend. Hand in hand and side by side they have struggled along, adding dollar to dollar and acre to acre, until they have now attained a competency. They built, in the summer of 1910, a handsome ten-room house that is not excelled in appearance and surroundings by any in the county. Surely, Walnut Grove Farm is a comfort to the owner, and a credit to the community. We are pleased to call your attention to a large view of Walnut Grove Farm on another page of this work. Mr. Wright is a staunch republican. 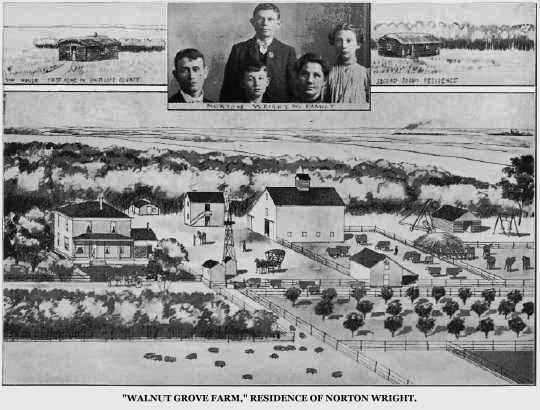 "Walnut Grove Farm," Residence of Norton Wright. What persistence in an idea, what perseverance in a course laid out will do is illustrated in the life of Doctor Hiram H. Hoagland, of Plainview, Nebraska, who, by the exercise of those traits, accomplished his purpose of becoming a physician against conditions and discouragements that would have appalled a less resolute man. Born in Fox township, Sullivan county, Pennsylvania, October 19, 1832, the first twenty-two years of his life were spent there. While still a youth, he began the study of medicine in the office of Doctor Webster, of Hill's Grove, Pennsylvania, and was making good progress in his profession. His marriage in his twentieth year delayed materially his progress in his profession, as the support of an ever-increasing family drove him to the earning of daily bread at a time when he should have been prosecuting his studies. For sustenance he found work at the blacksmiths' trade in various towns throughout Pennsylvania, reading in the office of some local physician in each town where he happened to reside. He was still busily pursuing his studies when the war broke out, and during the latter year of the war enlisted in company C, First New York veteran cavalry, in September, 1864, and served until the close of hostilities, seeing service in West Virginia, near Charleston, guarding the salt works. Having attained the desired proficiency in his chosen profession, Doctor Hoagland returned to Bradford county after the war, and began practice, continuing in the profession there and in Susquehanna county until 1871, when he came west. Locating in Carroll county, Iowa, he practiced there four years, then removed to Denison, Crawford county, Iowa, where he was engaged in practice until his removal to Nebraska, in 1880. In the spring of that year, he came to Antelope county, and filed on a homestead claim, eight miles west of Plainview, and began the life of a pioneer. His desire was to abandon the practice of medicine, but a colony from Denison would have no other physician, and his fame as a healer soon spread throughout the countryside. About ten years after settlement in Nebraska, he bought a tree claim, the seventh claimant on the same land, planted his trees, and made good his title. In 1898, he removed to Plainview, and has, since 1908, served as justice of the peace, having filled the same office for twelve years in Antelope county. Doctor Hoagland was first married in Bradford county, Pennsylvania, in 1852, to Miss Fannie Harrington, who died at Elmyra, New York. Of six children born to them, but two survive, Gertrude, wife of Frank Crandall, of Chicago, and George, living at Elmyra, New York. Of his second marriage, in Carroll county, Iowa, to Miss Lodema Colelo, two children were born, both of whom have followed the mother to the grave. The Doctor was married in Antelope county, Nebraska, to his present wife, who was Miss Ella Passmore, a native of Jo Daviess county, Illinois. Their four children are: Vera, a teacher of South Dakota; Erma, who was for a time teaching in Nebraska and South Dakota; Ora Delos, the only son, is a student of the Plainview schools, class of 1912, as is Lida Mary, the youngest. The Doctor has had a varied life, extending from the old established customs and institutions of the east to the wild and open country of the western frontier. He has passed through the scenes of peace and war, and knows what it means to earn his daily bread by the brawn of his sinewy arm, as well as by the brain and skill of the professional man. He bears up well the weight of his many years, and has won, by his sterling character and worth, the respect and good will of all his fellow townsmen. A leading, old-timer of eastern Nebraska is found in the gentleman above mentioned, having come to Howard county in the year of 1879, when that region was just beginning to be settled by many who had come to this new country to build up a home and fortune through industry and perseverance, and who by dint of good management and oft times much privation, have accumulated a competence, and helped to make the history of the west. Mr. Smith was born in Elk county, Pennsylvania, near St. Mary's, February 28, 1861. When our subject was nine years of age, the family of father, mother, brother and three sisters moved into Benton county, Indiana, where the father followed farming, and here they remained nine years. In February of 1879, the family, excepting two sisters who had married, moved into Howard county, Nebraska. One of the sisters was married to Vincent Horak, and one to Lewis Anstett, and both families later became residents of Howard county. Vincent Horak died on his home farm in St. Libory district, in June, 1901, survived by his widow and eight children. Upon first coming to Howard county, our subject's father homesteaded on section eighteen, township thirteen, range nine, which remained the home farm until his death, which occurred March 25, 1905. The mother had passed away in June of 1903. Mr. Smith had, upon coming to Howard county, remained on the homestead farm several years, assisting his father to break up the land. On becoming of age, he took up a timber claim on the southeast quarter of section twelve, township thirteen, range ten, which has always remained his home farm. This is well equipped with good buildings, and is known as Sunny-Side Farm. Mr. Smith was married to Miss Flora Rice, on the Rice homestead farm in Howard county, July 15, 1886. Miss Rice was a native of Illinois, and came into Howard county in 1881. Mr. and Mrs. Smith have nine children - a charming family: Viola and Laura, who are teachers in the public schools; Leo, Margaret, Carl, Catherine, Elizabeth, Paul and Bertha, all of whom reside under the parental roof. Mr. Smith is active in all matters of importance to his home, county or state. He has passed through much of the early hardships of pioneer life, and is a self-made man. He has been treasurer of his school district, number forty-six, for fifteen years. Peter Christian and wife are to be classed with the honored pioneers who came to Nebraska at a time when they had to endure many adverse conditions, and win their way to success by untiring energy and industry. They have been identified with the upbuilding and progress of central Nebraska, and were among the number who began their life there in sod shanties. Mr. Christian was born in the town of Faaborg, isle of Fyen, Denmark, the second child of Jens Christian and wife. He first saw the light of day May 18, 1848, and had one brother and one sister. He was the only one of his family to come to America, which he did after receiving a common school education in his native land. He came in 1866, sailing from Copenhagen in the "Prairie Queen," making a landing at Christiana, where three hundred more emigrants were taken aboard. They landed in New York city, May 1. Mr. Christian first followed lumbering, river driving and farming in Wisconsin, locating first in Winnebago county. He was married at Berlin, Wisconsin, March 8, 1873, to Hannah E. Clausen, daughter of Jacob and Karen Clausen, who came from Denmark in 1866, and now reside at Denmark, Brown county, Wisconsin. Mrs. Christian was the eldest of their children - two sons and three daughters - all of whom live in Wisconsin, except Mrs. Christian. Mr. Christian's parents died in Denmark, both about 1876, and his brother and sister still live in their native country. In the fall of 1877, Mr. Christian and wife moved to Brownsburg, Hendricks county, Indiana, where he was superintendent of a big farm owned by a wealthy citizen of Indianapolis. In the spring of 1881, he drove with a prairie schooner to Valley county, traveling over the trail taken by others, who were going in the same general direction. The journey lasted seven weeks, delays being caused by having to ford streams or ferry, all bridges having been washed away by the unprecedented floods of the spring. Even the bridge across the Missouri river at Plattsmouth was swept away. They had but about fifteen dollars cash capital, and had many hard years before them. They located on the homestead on the northeast quarter of section twelve, township seventeen, range sixteen, and this remained their home for many years. He became interested in selling windmills, pumps, etc., and erected the first implement store in the then new town of Arcadia; in 1884, remaining in that business until 1895. Prior to engaging in that line, he had paid considerable attention to the stock business, and for the past fifteen years has been extensively interested in buying and selling, feeding and shipping cattle and hogs. He has been a pioneer business man along various hues, and has always had the best interests of the region at heart. He sold the original homestead tract, but still owns his first purchased farm near Arcadia. He and his wife now reside in one of the finest modern homes in Arcadia, and have a large number of friends there. They have an adopted son, Jesse W. Christian, who is a carpenter, builder and contractor by occupation. He lives in Arcadia, is married, and he and his wife, who was Miss Emma Stone, are parents of three sons and three daughters. Mr. Christian and wife have also taken into their home at various times other children who were in need of tender care and attention, and are possessed of kind hearts and generous natures. Mr. Christian has assisted in no small way in the upbuilding and welfare of Arcadia, not only as a business man, but as a citizen who is always ready to help in any measure of progress. Mrs. Christian well remembers their early days in the dirt-roofed sod house, which offered such poor protection from the storm and rain. In those times she often remained at home to care for the cattle and hogs, while her husband worked away for a time to help with their finances, doing her full share to help make a start in the new home. Mr. Christian has been a life-long republican, casting his first American vote for Grant at the time of his first campaign. He has weathered many of the storms and blizzards that swept the west, and one hailstorm that he encountered was especially severe, having torn the top of his buggy to a shapeless wreck. Alex. E. Cunningham, an agriculturist of prominence in Madison county, Nebraska, resides in Battle Creek precinct, on section twenty-seven, township twenty-three, range two, and is one of those substantial citizens whose integrity and industry, thrift and economy have added so much to the material wealth and growth of Nebraska. Mr. Cunningham is a native-born Nebraskan, his birth occurring on his father's homestead farm in Madison county, April 13, 1873. He is a son of Augustus M. and Mary E. (Ellis) Cunningham, who were both natives of Pennsylvania. The father came to Madison county, Nebraska, in 1871, and this has remained his home ever since. He served in the civil war, enlisting in Company A, First Pennsylvania infantry, in 1861, and received his honorable discharge in 1864. During his service, he was wounded at the battle of Gettysburg. Our subject's father moved to Nebraska in 1871, as before stated, coining from Pennsylvania, his native state. After his arrival here, he took up a homestead claim on section twenty-seven, township twenty-three, range two, which remains the old homestead farm to this day, and where our subject now resides. On this land was built a shanty, ten by twelve feet, where three families lived a part of one winter. During the first years of residence on the frontier of the far west, our subject's parents and family, like so many of the brave sons who came to this new, unsettled region, endured many hardships and privations, as well as frequent dangers. The first few years, the grasshoppers came in hordes, and cleaned up crops and pasture, leaving barren wastes of ground, where but a short time before their arrival, plentiful and promising crops had been growing almost ready for harvest. This was about the greatest source of losses the early settlers had to endure. Many times the family were compelled to burn hay and cornstalks to keep warm in the winter, as wood and coal were hard to get, and the price too high to permit of using for fuel in this region. As late as 1894, the family again lost the season's crops by the hot winds, which came as a result of the great drought of that year, all vegetation being burned to a crisp. But those are days which have passed to history, and our subject now enjoys the comfort and prosperity which time and improvement have brought to this section of the country. He now owns three hundred and twenty acres of fine land and a good home. Mr. Cunningham was united in marriage age in 1906 to Mrs. Effie Cunningham, a native of Illinois. Mr. and Mrs. Cunningham have had two children to bless their union, Arthur and Leona. Mrs. Cunningham had one son by her former marriage, Newell Cunningham, who resides with his step father. Mr. Cunningham is a republican.